It was once the ugly duckling of gaming and now is thriving and growing beyond any expectation: a proper 2018 Warframe Review is needed! But “What is Warframe?” is surely the most pivotal question. Is it an MMO? Is it even multiplayer? Is it a shooter or a slasher? If there are experience and levels, is there an endgame? What are warframes? Is it similar to any other titles? Is it sci-fi or are there spells and magic? How much does it cost? Warframe is science fantasy and not science fiction (sci-fi). The latter implies that the narrative elements (robots, machines, spaceships, etc.) have a realistic, scientific explanation; science fantasy, on the other hand, employs supernatural elements (magic, souls, the afterlife) which don’t have any (convincing) possible explanation. A strong example of sci-fi are the works of Isaac Asimov, while Star Wars is obviously science fantasy. It’s no secret that Digital Extremes wants Warframe to be sci-fi. However, the game features a plethora of elements, such as the abilities of the warframes themselves, that feels much more like superpowers or even magic: conjuring various elemental effects, such as avalanches, tsunamis, firestorms, lightning; necromancy and vampirism, psychic manipulation, shadowy assassination, blinking, healing and more). Furthermore, the narrative itself incorporates symbolic elements, enhanced by metaphors for rebirth, motherhood, and identity, that are only vaguely explained and have a distinct spiritualistic vibe to them. Creator intentions and genre analysis aside, the game feels like a high-tech, futuristic fantasy, featuring combat units (warframes) with superhero-esque powers. But what is a “warframe” exactly? Trying to avoid spoilers, all a beginner needs to know is that they get to play a disincarnate consciousness, the Tenno, that is awoken from a deep slumber. This consciousness is able to possess and take control of humanoid exoskeletons: the warframes, through a process called Transference. Warframes vary in stats, looks, and abilities. 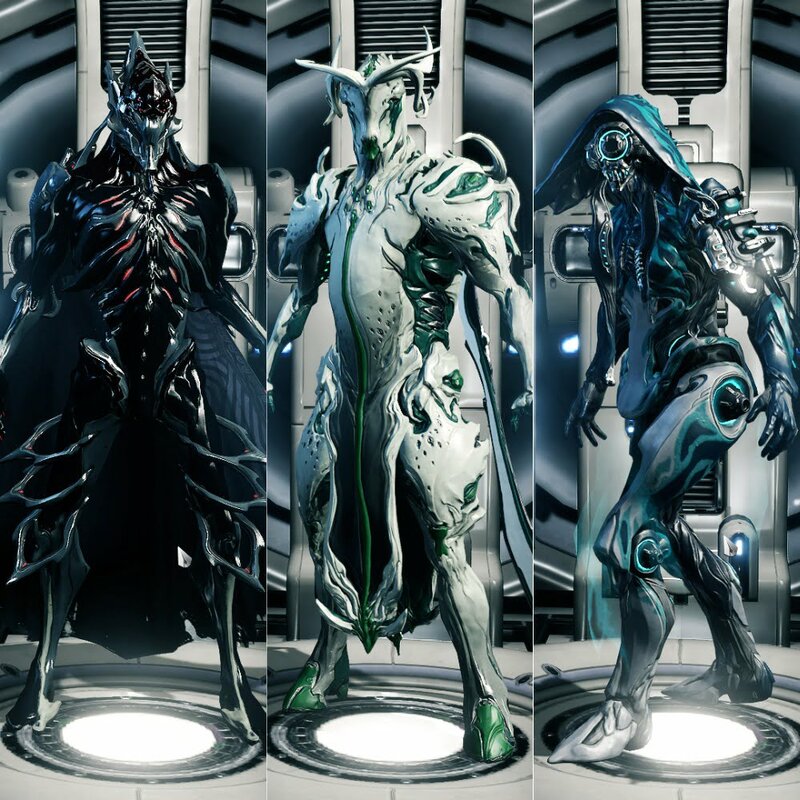 The devs have gone through a lengthy creative endeavor in order to ensure that every warframe is both unique and powerful in their own way. It is, however, obvious that each one of these vessels has their advantages and disadvantages and is suited for different tasks. A player can possess all of the warframes and will undoubtedly end up playing most of them for a while, in order to establish which one they like best and which one suits their particular playstyle. Much like everything in the game, a warframe doesn’t only become more powerful with levels, but can also be outfitted with weaponry and upgrades, customizing even further its approach to combat. It is, however, obvious that certain warframes have a more tactical approach to combat, others rely heavily on endless battle prowess and vigor in order to dispatch their enemies, while some prefer healing or defense. Having said this, the lines between the usual multiplayer archetypes, such as healers, tanks, supportive units, and damage dealers, are rather blurred and few warframes fall comfortably in such categories. Hack and Slash or Shooter? Warframe features a third person, behind the shoulder, camera: kind of like Mass Effect. But a Warframe Review can’t be proper without mentioning the game’s incredible combat system. A typical Warframe trailer might give some the idea that the game is a shooter; others might see it more like a melee “slasher” game, featuring katanas, shields, whips, polearms and more; while some might clearly think it’s all about using powerful abilities to decimates one’s foes. All of the above are true: the game combines different systems in order to generate a unique combat experience. Primary weapons are two-handed, ranged armaments, such as bows, rifles, grenade launchers, sniper rifles, spearguns, and more. When coupled with secondary weapons, like dual guns or sidearms, they make for most of a player’s ranged arsenal. Melee weapons, the most varied category, featuring claws, staves, scythes, machetes, war fans, rapiers, daggers, and more, are deadly instruments for close encounters. Borrowing from melee focused games, Digital Extremes has implemented a combo system and a stance system. The latter allows a player to customize the moves of their warframe while using a given weapon category. This means that two players can employ the same sword in two different ways. All of these weapons have distinct functions and are to be taken into consideration in the context of different builds. A primary weapon strong in single-target damage would be unnecessary when paired with a secondary already proficient in that area. Similarly, a warframe incapable of absorbing or avoiding direct hits, wouldn’t be able to leverage the potential of a strong melee weapon. Such elements, alongside many more, are to be taken into consideration when choosing and upgrading one’s arsenal. During the first hours of gameplay, players take hold of their Orbiter, a spaceship that actively functions as your home, and allows the Tenno to store their resources, warframes, and weapons. 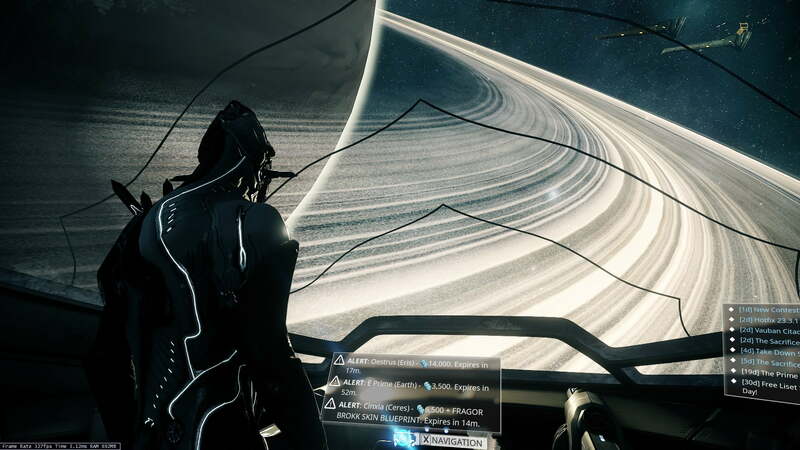 Among its other functions, the Orbiter features a Navigation tool, that gives players access to a galaxy map. The latter presents different planets and space locations, all of which have a plethora of mission “nodes” that one can select. 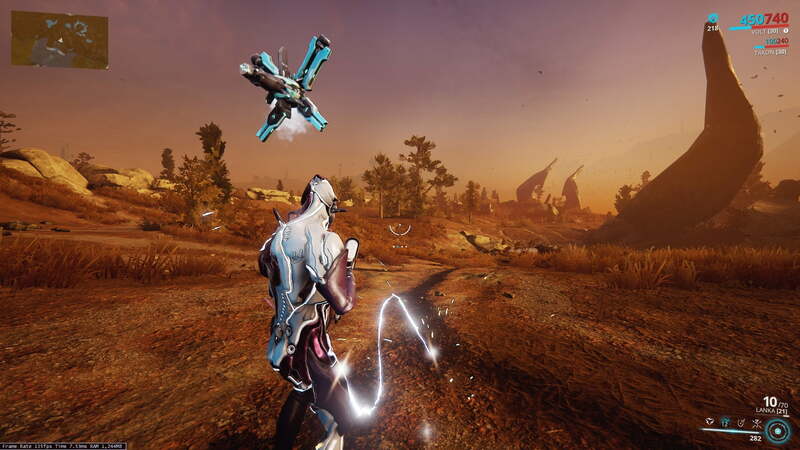 When a mission is selected, the warframe, alongside their selected weaponry, is deployed on a planet’s surface, where they have to go through a procedurally generated map and compete for certain mission objectives. Speaking of mission objectives, there’s actually a rather wide variety of them: spying, rescuing, assassinating, defending an objective, and more, are all tasks the player must learn how to perform. At the end of each mission, resources and additional rewards, depending on the mission itself, are awarded. Notable kinds of goodies are warframe components, weapon schematics, and mods. The latter is probably one of the pivotal aspects of the game because they are used to modify and enhance the player’s arsenal, including the warframes themselves. Every mission node can present an enhanced version, modifying the inherent tasks, difficulty, and/or rewards bestowed upon its completion. These enhanced versions are also quite a lot in nature and type, thus never becoming tedious. With the Plains of Eidolon patch, however, things have been shaken up a bit, because it added Cetus and the Plains of Eidolon, a beautiful city and a wide open map, reminiscent of the sizable lands of MMOs. As said previously, questing throughout the Galaxy Map delivers loot, such as weapons, new warframes, and mods. In addition to these, there are combat companions, items, and more. All of these elements must be employed in order to forge a sensible build that allows to player to unleash their potential, while also creating a functional and unique playstyle. Often compared to Destiny, Bungie’s well-known game, Warframe resembles Diablo or Path of Exile far more, at least as far as in-game builds and customization are concerned. It is a huge step away from the very restricted, “cookie-cutter” builds of the traditional MOBAs and MMOs, allowing for infinite customization and variety as far as combinations go. It is paradise for metagame lovers, as theory crafting and strategy innovation are pivotal parts of the entire experience. In fact, the game has a thriving community and an ample following. While on their Orbiter, the players can select whether they would like to embark on missions alone or be clumped up with other players. Needless to say, more difficult content, while not forcing you to play with others, is definitely more approachable in a group. Even more so if the players have coordinated their builds in order to correctly leverage the teamplay potential. Warframe is certainly not an MMO, nor an RPG. It doesn’t feature a persistent world in which players are seamlessly integrated, and bump into each other by chance. There are small persistent areas, such as Cetus or some planetary stations, but they are nothing more but small player hubs. Every map, or elements of it, is partially or completely procedurally generated at the moment in which a player selects to embark on a given mission. However, there are elements that maximize player interaction, such as Clans and the market (you can exchange certain items for in-game currency with other players) that do take advantage of the online nature of the game. Not to mention that every task is more fun with friends. Unlike MMOs, Warframe doesn’t focus on endgame content. None the less after hundreds of hours of gameplay, many of which spent grinding for the resources and mods, many would like to tackle more challenging content. As of today, Warframe offers daily sortie missions, and kuva missions, all of which bring the difficulty to the next level, and require control and understanding of the game in order to be completed. Furthermore, periodical events, with time-limited awards are constantly produced by Digital Extremes, in order to keep the playerbase engaged. Most excitingly, the Terralysts, colossal mechanical beings that roam the Plains of Eidolon at night, are hard, but rewarding, pray for veteran players. Last but not least, “fashionframe”, a comical term used by the community to indicate the tendency to fashion one’s weapons and warframes with visual enhancements, very often comes up when talking about endgame. That is because these aesthetic accessories are quite costly, and can be obtained only through Platinum, an in-game currency. At this point, you should be compelled to play Warframe, but such an enormous game must be expensive! Well, it’s actually Free-to-Play, while featuring an in-game market. The aforementioned Platinum is a currency obtainable either by trading with others or through paying with real-life money. It can be exchanged for almost anything in the game, including the most powerful weapons and warframes, rare resources, and even rare mods. This last feature is very controversial, and can’t be tackled easily since the game has been accused of being Pay-to-Win. However, suffice it to say that even if such accusations were to be true, paying to obtain more power doesn’t really interfere with other player’s experience, since the game isn’t competitive at all. It would be widely preferable, however, if Platinum could buy cosmetic items exclusively, and wasn’t the only trading currency available. In conclusion, not playing Warframe is a waste of time. If you want to know more, check out the game’s main site, visit the forums and ask other players what they think, or check out PivotalGamers’ own Warframe database.